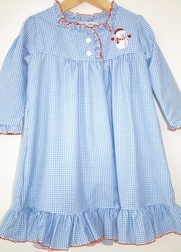 A precious blue gingham night gown for little girls by Sweet Dreams. 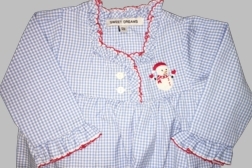 It has long sleeves, buttons on the bodice and a pretty ruffle at the hem. The gown is trimmed in various places with red picot. 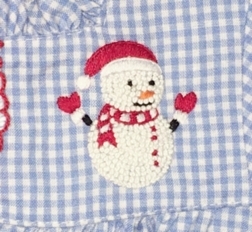 It has the cutest embroidered snowman also on the front!